Brave New World: BioStamping: The New User Authentication? Earlier this week we wrote in our article, Shifting Technology Boundaries, about the dangers we face in trying to balance the shift from a content orientated technology to one that is focused on context. The change to developing social, cultural, behavioural and tracking technology is significant and one we all appear to be sleepwalking into with little debate or questioning over who owns and needs what information about us. Unsurprisingly Amazon this week announced their one click social connection which will enable you to connect to other services via Amazon. It’s all about convenience and not consequence. Today’s Telegraph takes the emerging technology to a higher level and introduces the new passive authentication technology being researched by the likes of Motorola and Nokia. They are not alone and the technology which is purported to obviate users having to be forever logging onto their devices, or avoid their information being hijacked by others, is now taking us down a road of being permanently traceable and switched on. 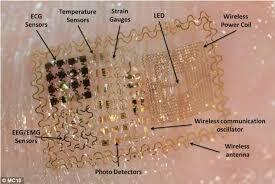 Tattoos attach to a user’s skin via a rubber stamp have been developed by US firm MC10. The likes of Motorola and Nokia hope that these ‘Biostamps’ , which were initially developed for medical purposes could now be used for user authentication purposes. They are also researching the use of the Proteus Digital Health pill, which is approved by the US Food and Drug Administration and the European regulator. This is a pill containing a computer chip that is powered by a battery using the acid in a user’s stomach. The pill creates a unique signal like an ECG trace that can be picked up by devices outside the body and can be taken daily for up to a month. Authentication can be irritating and despite many not bothering to use it, we have to question whether these biostamps are the answer.